You are here: Home / Galaxy Note 4 How-To Guides / How to take a screenshot on Galaxy Note 4? When you want to show someone remotely the Galaxy Note 4 screen, e.g., the achievement in a game, booking proofs, ordering info, some key information on a website, location in the Google Map, a Galaxy Note 4 screenshot is the most simple way to deliver such info. But how to take a screenshot on Galaxy Note 4? Luckily, there are many different methods to take screenshot on Galaxy Note 4. In this guide, I will show you 3 different methods of taking a screenshot on Galaxy Note 4 without using any apps, or connecting to other devices. In other words, you can take a screenshot on Galaxy Note 4 directly. No apps, or connections are involved. In the early days, most Android phones had a hardware home button. The Home button and power button combination is usually for screenshot. Samsung is a few Android manufactures who refuse to bury hardware home button. So, you can have a simple way to take a screenshot on Galaxy Note 4. On any screen, press and hold power button and Home button simultaneously to take a screenshot on Galaxy Note 4. Galaxy Note 4 exits current app and return to home screen. This means you press Home button too early. Galaxy Note 4 shows power options (restart the phone, shutdown the phone..). This means you press Power button too early. The secret of successfully taking a screenshot on Galaxy Note 4 is to press and hold the power button “slightly” earlier. There is a reason for this secret. Home button will response normally within 100ms (about 0.1s) once pressed. But power button only responses usually after 500ms (0.5s). Using Home button and Power button to take a screenshot works not only on Galaxy Note 4, but also on almost all Galaxy devices from Samsung. The second method of taking a screenshot on Galaxy Note 4 may require patience. But it is fun. 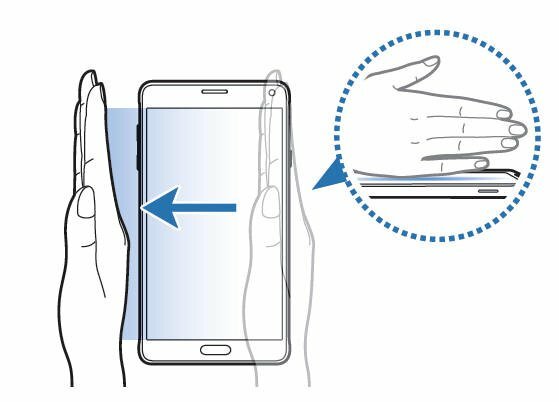 You can simply swipe your palm over the Galaxy Note 4 screen as shown below to take a screenshot on Galaxy Note 4. By default, this feature is turned on. But you may accidentally turned it off if you find this method is not working. Step 1: Go to settings –Motions and gestures. Step 2: Tap Palm swipe to capture if it is off. Step 3: Turn it on by drag the switch to right until the color is green. Again, this palm swiping method of taking a screenshot on Galaxy Note 4 also works on most other Samsung Galaxy devices. In old Galaxy Note devcies (Galaxy Note, Galaxy Note 2, Galaxy Note 3, Galaxy Note 8.0, Galaxy Note 10.1, Galaxy Note 10.1 2014 edition and Galaxy Note Pro), you can take a screenshot by holding the S Pen button, then tapping and holding the S Pen on the screen. But this S Pen method does NOT work for Galaxy Note 4, due to the new smart select feature in Galaxy Note 4. Then, can I take a screenshot on Galaxy Note 4 with the S Pen? 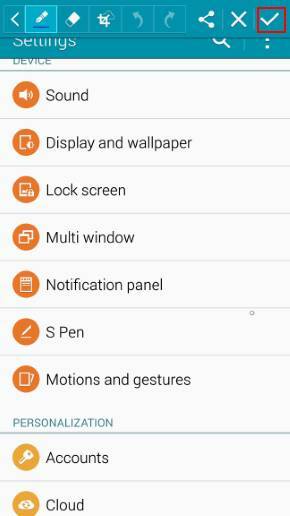 Yes, you still can use S Pen to take a screenshot on Galaxy Note 4. But now you need use one of the four air commands in Galaxy Note 4: screen write. Air command will be launched when the S Pen is removed from the slot, or when the S Pen is hovering over any part of the screen with S Pen button pressed. In the four options of air command, tap screen write to take a screenshot on Galaxy Note 4. Once the screenshot is taken, you will be offered the options to edit, share, and save the screenshot, as shown below. Tap the check symbol to save the screenshot. Please note, when screen write is used to take a screenshot on Galaxy Note 4, the editing option is always provided and the screenshot is NOT saved until you tap the check symbol. This behavior is different from the previous 2 methods. Screen write was introduced in Galaxy Note 3. So this method also works on Galaxy Note 3, Galaxy Note 10.1 2014 edition and Galaxy Note Pro. Are there any other methods to take a screenshot on Galaxy Note 4? Yes, there are some other methods to take a screenshot for Galaxy Note 4. One of the most common method for all Android devices is through Android debug monitor. But this required enable some developers options and USB connection with the PC. Do you have any problems to take a screenshot on your Galaxy Note 4? Please let us know your problems in the comment box below. We will try to help you. There are several methods to take screenshots on Galaxy Note devices. Using the S Pen is the easiest. I have taken several screen shots in the past and I have been able to hit the share symbol and I shared a picture or whatever in the messages, but now it goes to contacts, I would lime to continue in messages but I can’t seem to, it only offer me to share other options but I still want to go the way it was at first . Can you help ? How about sharing photos in Gallery app? Does messages app appear in the list? I was able to take a screenshot using just the home button prested for 2 to 3 seconds, however now it keeps on coming up with Google assistance t which has never happened before. You need to use power button+home button, but just home button, to take screenshots. If you get Google assistance, it means you pressed the power button too late. My phone note 4 says ‘Unfortunately, system UI has stopped working’. There is no fix for this. You can try to reboot the phone so that you will not get such an issue often. For whatever reason using my Note 3 everytime I take a screenshot it takes me to the editing option as if I was using my S pen. Im no longer able to take multiple screenshots cause every time I do it wants me to screen write but I don’t want to. Please help!!!! You probably turned on edit after screen capture. You can disable it in settings – display – edit after screen capture. After an update my Note 4 does NOT take snapshots using the Palm Swipe. The option is on in the settings. I tried it in Safe Mode and it did NOT work. I read all the above threads and none provided a solution other that Screen Write. Is it a know bug for Palm Swipe not to work after recent updates? There are no known issues with palm swipe to capture in Note 4 update. The method itself is a bit tricky. You may try it a few more times. You can also try to reboot the phone to see whether it helps. It is not tricky, I’ve done it many and multiple times and it is simple. However, it just stopped capturing with a swipe!!! Reboot does not help. You can try to disable and then enable it. Also, you can test it in that page (do not test in Home screen. which is too sensitive to the touch of palm ). No go. Disable and enable did not fix it, and tested in that page! Once again it works with Screen Write, however not with Palm Swipe! Not sure about the issue. Anyway, it’s not an important feature. I had a note 3 and loved the “edit after capture” that you could do on a screen shot before saving the image. I haven’t figured out how to do that on the note 4 🙁 I’ve tried to look it up but I’m just not finding anything. Does anyone know? In the notification panel, you can find the option to edit option for screenshot taken. Where on notification panel is it I cannot find it anywhere. My Samsung Note 4 will not take screenshots by using the power button on the home screen button worked fine one day the next day it wouldn’t do it the morning it’s stopped working I saw something in the top left corner that said debug any suggestions? Reboot the phone should solve the issue. Since my last update of my galaxy note 4, screen shot by pressing Home with Power button brings up Google page, even when I press Power button slightly earlier than Home button. My palm screen shot never worked from.the beginning even it is enables in the Motion &Gestures in the Setting. So, now I can screen shot only with S pen but I like to be able to use Home&Power button as I always used before. There are no known problems for any of the 3 methods for taking screenshots on Galaxy Note 4. It seems you pressed home button too early. For the method using palm, it’s a bit tricky. When you have time, you can practice it a few times. Did you enable it in Settings? Did the error happen to all apps? Did you try it in Chrome browser? Try it. Also S Pen method is the easiest one to take screenshots. What’s did you get when you say you cannot take screenshots? I told you i cannot take screenshots ! USING ALL METHODS BECAUSE IT WAS BLOCKED BY THE SECURITY POLICY!! Can you take screenshots for home screen? If your phone is set up by IT Dept, you should check with them. For DRMed contents, you cannot take screenshots fur copyright issues. You press power button to late. Normally, you can press power button slightly earlier. Can you still take screenshot with S Pen? I am having the same issues after marshmallow update too. I had the same error message as Felicia. Rebooting doesn’t work. Same error msg came right back up. The issue can be caused by some apps or old settings. As this happens after a major update, you may back up the phone, then try a factory data reset. AFTER UPDATE MY NOTE 4 TODAY. MY SCREENSHOT USING PALM CANNOT WORK. CHECK ON SETTING AND THE PALM SWIPE TO CAPTURE IS ON. YET I CANT USED IT. TRY USING THE HOME N RIGHT BUTTON IT DOES WORK. JUST THAT I WAN TO USE PALM SWIPE INSTEAD OF THE HOME BUTTON & RIGHT BUTTON. Taking screenshot with palm swipe if airways tricky with like successfully rate. You can try to let hand slightly touch the screen. Also, if it’s a major update, you may try to clear cache partition as well. My Note 4 updated the other day now I can not take a screenshot with power and home buttons or handswipe. Why? Power+ home button should always work. 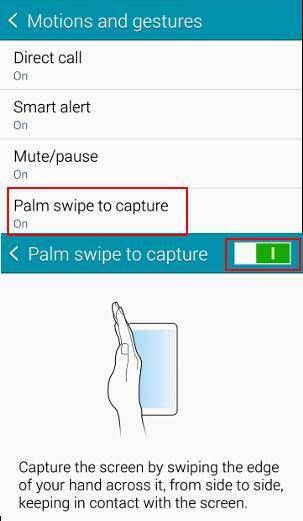 Palm swipe requires you to set it up in settings – advanced features – palm swipe top capture (for Marshmallow). I cannot take screen shots in my galaxy note 4 anymore. “Power+ home button should always work” No, it does NOT work. Neither Palm swipe (yes, it is activated). What did you get when you hold the two buttons? You need try it a few times. You can also reboot the phone and try it again. My note 4 stopped taking screen shot by pushing lock and home buttons at same time. I don’t know why. This just stopped working today. Is there a way to correct it. What did you get when you pressing the two buttons? I can successfully screenshot all 3 ways. My question is, is there a way to change the format that it saves it in? For example, a screenshot taken with my s pen saves it as a JPEG. But a screenshot done with the home and power button area saved as PNG images. Is there a way to change the format in which the S PEN saves the image format? (at this point I’m preferring it be saved as a PNG). As I know, no, there are no options to choose file format for screenshots. Hi! I updated the software of galaxy note 4 and even though the swipe screen gesture is switched on, I am unable to take the screenshot as I used to. Is there something wrong with the update or what? Nothing charged on taking screenshot. 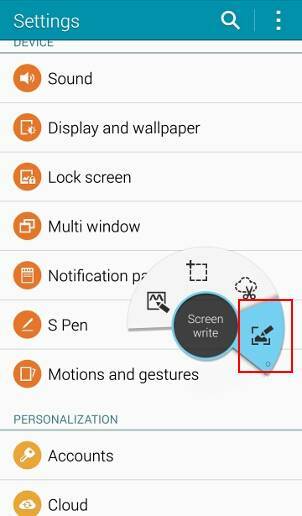 You can always use screen write to take screenshot on note 4 if you have problems to use physical buttons. Neihter of the 3 methods above work on my phone. What do you get? The S Pen method should work always to take av screenshot. How do I remove an image from my lock screen that was placed by accident? Do you mean lock screen wallpaper? Open settings – wallpaper. Tap home screen near top left, you can select lock screen or home screen and lock screen to select a new lock screen wallpaper. if you are using screen write, tapping the screen write should take screenshot and ask you to edit it. You only need tap the button once when S Pen is hovering over the screen to activate air command. Then you can choose screen write. Using other methods to take screenshot should not ask you to edit in Galaxy Note 4. The combination of power and home button used to work, but it’s suddenly changed to opening “ok google”. I’ve searched and can’t find anywhere to change this or how this could have been altered. If you have advice to fix it, please let me know. It still works on the same way. It seems you pressed the home button too early. After rebooting to Safe Mode this feature worked again which means that some third parties app had interfered. After rebooting back to normal, the problem came back. I found a workaround: you have to Collect the selection (lower right button with an icon of a drawer or something) and then open it again. You can Share it now via multitude of apps. Not sure about the issue. Thank you for the update and sharing. after updating to Lollypop you can no longer SHARE an S-Penned / Air Commanded selections for device claims that “no apps can perform this action“. You can only sent the data to the Scrapbook. Note 4. After updated to lollipop, my note 4 cannot screen-capture with home key and power key. I also tried palm swipe also cannot. Never happen before updated. Pls help! I just tested. All three methods of taking screenshot on Note 4 still work after the Lollipop udpate. If you press home button + power button, what do you get? I’m getting this problem too jist updated the other day and now I can’t do it this way either. It comes up asking what action to take.? ScreenWrite through Air command should always work if it is enabled in Settings–S pen –Air command. This is the easiest way to take screenshot on Note 4. It is mentioned as method 3 in this page. Home button + power button method to take screenshot should always work. You even cannot turn it off. You need press and hold 2 buttons simultaneously. Palm motion is a bit tricky. You also need enable it in Settings — motions and gestures. I updated my note 3 with lollipop software now I can’t take screenshot with my pen anymore. I have tried many times. All of them should still work. Reboot the phone and try again. Can you use air command? I have had the same problem for months! I recently reset my phone for other reasons and it still won’t let me screenshot with my s pen. It’s frustrating!! Can you access air command? Need help with S pen also. My air commands come up when I detach but not when I hover and press S pen button. Have tried on several different pages and others have tried also. Please help. You need press the s pen button just once when hovering the s pen over the screen. Do not hold the s pen button. No, you cannot change the default storage location for screenshots taken on Galaxy Note 4. You can manually move them to other folders with any file managers. Google just announced that all photos stored on Google Drive are now available in Google+ photos and vice versa. I often take screen shots on my Note 4 by gently sweeping right to left with the side of my palm. The shot goes right to Google+ and is immediately available via the Google “photos” app. Piece of cake. This is normal because of the high resolution of the phone screen. MMS always resizes the image. You can try to attach the screenshot to a message,instead of using share. You can also share it through Google drive or other cloud storage. Thanks. I kept thinking it was just me and that I wasn’t doing something right. When I try to use my palm for the screen shot it usually just changes the page. Like if I was using my fingertip. it is more or less a gimmick. Try to use S Pen or the physical buttons to take screenshot. They are easier. Is the pictures folder corrupted? Can you check the folder with My Files app? Having the same problem … picture folder seems to be corrupted….. what should I do? Can you open the pictures folder with My Files app? If not, you may have to backup and reset the phone. Any suggestions for VIDEO screen capture without rooting my Note4? Most apps require root for screen recording. if you want to try, you can use SideSync on PC, then get a screen recorder software for PC. You pressed power button too later. Normally, you can press and hold power button slightly earlier. No sir, I press the power button slightly before. I’ve never had this problem. There is a way to disable that feature. I have inadvertantly done this before but cant remember how i googled and got it back. That will teach me to put my phone in my back pocket without the screen lock on! Just restarted my phone and it came back! My note 4 won’t take a screenshot using any metho at all. Probably going to return it & go back to HTC 1.
the ScreenWrite should always work. It is probably the easiest way to take screenshot on almost all mobile devices. I don’t think HTC one has a better solution. I don’t have the palm swipe option on my note 4!!! What are available in settings – motions and gestures? Using S Pen is still the easiest way to take screenshot on Note devices. When I take a screenshot with S Pen, it just makes the shutter sound and saves it in the background to my gallery without opening it for edit and share…… where’s the setting? If you are using Screen Write, it should always ask you to edit. In Galaxy Note 3 and older Note devices, in Settings–Display, you can find the option to turn on off editing after capturing the screenshot. But this option was removed in Galaxy Note 4. The option of editing after screen capture was removed in Galaxy Note 4. You should use Screen Write feature to do this. I heard Samsung removed this feature due to the repeated feature in screenwrite (part of air command). Most users failed to find the settings to turn it off there and therefore Samsung got lots of complaints on this feature. I think Samsung then decided to remove this feature because users can always edit it in Gallery for non-Note users. For Note users, ScreenWrite can be used. Well one more reason to not like the Note 4 nearly as much as my Note 3. Only improvement I see is the camera, emojis, and messaging. Speaker is now on the back so it gets muffled lying on a soft surface like a bed. No more editing after scene capture without seeking out your images, finding the capture, reopening it, then editing. Or having to go open the image in your Photoshop app. And BOTH Note 4s we’ve gotten for me, brand new in the box, have had major issues with the Facebook app freezing and returning back to Facebook without hitting the back button. And, finally, the 4 can’t seem to learn Swype nearly as well. Constantly having to edit way off crazy words that are nothing close to what I swyped. It’s a constant fight with this phone. I miss my Note 3. 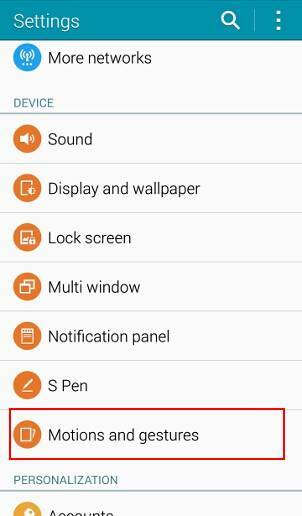 For taking screenshot on Note 4,if you use S Pen (Screen Write), it should always ask you to edit. If you use Home+power button, after the screenshot is taken, there is always a notification. You can access edit in notification panel. For Facebook app issues, you may clear cache and clear data for the app. For the keyboard, SwiftKey is far better for swiping. It has been free since last year. My phone always allowed me to take a screen shot with my palm, now it won’t. I’m not doing anything different and the setting is on! Sometimes, the sensor may be stuck or used by other apps. Reboot the phone to see whether it helps. It depends on the content provider. Normally, you can pause the video, use the s pen (screen write ) method. If not, you can take screenshot from a pc.